New York horn and drum dance bands Too Many Zooz and Moon Hooch have announced a co-headlining tour set for the spring of 2019. The run will see the bands throughout New England beginning on April 16 in Portsmouth, New Hampshire followed by a show in Portland, Maine on April 17. Too Many Zooz and Moon Hooch then head to the Fête Music Hall Ballroom in Providence, Rhode Island on Thursday, April 18. After a stop in Fairfield, Connecticut, the tour wraps up in Burlington Vermont on April 20. You can find a complete list of Too Many Zooz and Moon Hooch dates with select ticket info below. Too Many Zooz consists of saxophonist Leo Pellegrino, trumpeter Matt Muirhead and drummer David Parks. Moon Hooch is saxophonists Wenzl McGowen and Mike Wilbur and drummer James Muschler. Besides having similar instrumentation, both bands got their start busking in the New York City subways and were notorious for getting viral dance parties started on the platforms. 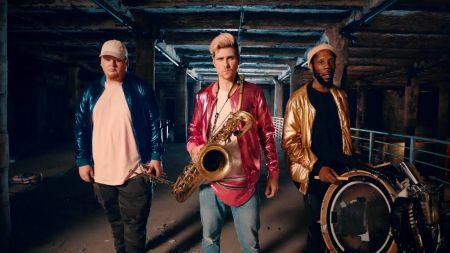 From the subways to the studio, Too Many Zooz released their debut album Subway Gawdz in 2016 and more recently released a music video for the track “Warriors.” Check it out above. Moon Hooch’s latest LP, Red Sky, arrived in 2016 and the band followed it with two EP’s 2017’s Joshua Tree and 2018’s Light It Up. Check out the Light It Up track “Acid Mountain” below. Also, read our most recent interview with Moon Hooch here. Don’t miss your chance to catch Too Many Zooz and Moon Hooch on tour this spring.